Needle sticks or cuts cause most infections in health care settings. The average risk of HIV infection after a needle-stick exposure to HIV-infected blood is 3 infections per 1,000 needle sticks. With each and every client, a health care provider should think, “What infection prevention is needed?” Any client or provider may have an infection without knowing it and without obvious symptoms. Infection prevention is a sign of good health care that can attract clients. For some clients cleanliness is one of the most important signs of quality. Decontaminate to kill infectious organisms such as HIV and hepatitis B and to make instruments, gloves, and other objects safer for people who clean them. Soak in 0.5% chlorine solution for 10 minutes. Rinse with clean cool water or clean immediately. Clean to remove body fluids, tissue, and dirt. Wash or scrub with a brush with liquid soap or detergent and water. Avoid bar soap or powdered soap, which can stay on the equipment. Rinse and dry. While cleaning, wear utility gloves and personal protective equipment—goggles, mask, apron, and enclosed shoes. High-level disinfect to kill all infectious organisms except some bacterial endospores (a dormant, resistant form of bacteria) by boiling, by steaming, or with chemicals. 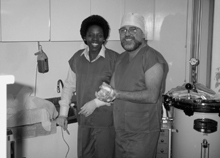 High-level disinfect instruments or supplies that touch intact mucous membranes or broken skin, such as vaginal specula, uterine sounds, and gloves for pelvic examinations. Sterilize to kill all infectious organisms, including bacterial endospores, with a high-pressure steam autoclave, a dry-heat oven, chemicals, or radiation. Sterilize instruments such as scalpels and needles that touch tissue beneath the skin. If sterilization is not possible or practical (for example, for laparoscopes), instruments must be high-level disinfected. Store instruments and supplies to protect them from contamination.They should be stored in a high-level disinfected or sterilized container in a clean area away from clinic traffic. The equipment used to sterilize and high-level disinfect instruments and supplies also must be guarded against contamination.